We had been out BASE jumping all morning off the Perrine Bridge in Twin Falls, Idaho when the winds picked up. High winds = no BASE jumping. So, we took a break and went for lunch in town. 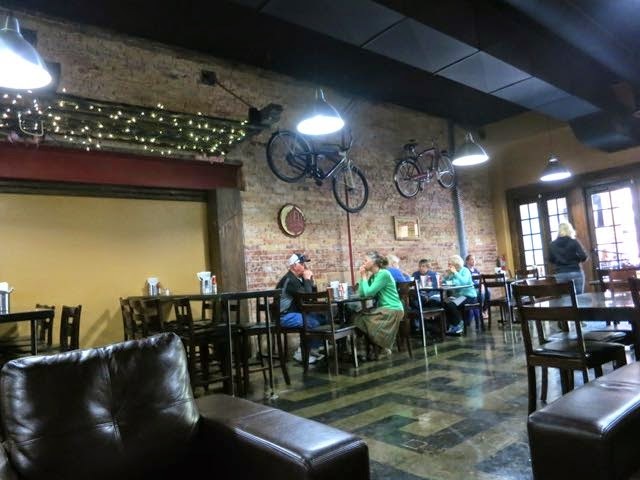 Who knew Twin Falls had a little downtown area? We didn't. 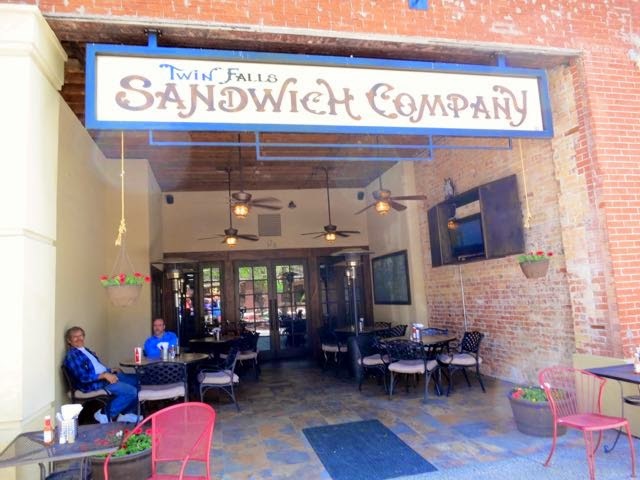 And there's a little sandwich shop called the Twin Falls Sandwich Company. Inside this place is huge for a sandwich shop! And it is a cool place to hang out. There are couches and tables with bikes hanging from the ceiling and guitars on the wall. 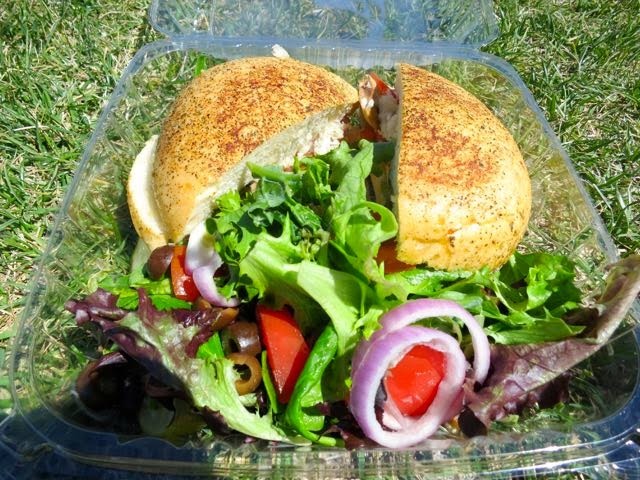 There are a few vegan options here including a cold hummus and veggie sandwich, a hot veggie sandwich, a vegan burger, and a vegan panini. I ordered the vegan panini to go. When we got back to the bridge, I opened up the package and it looked great. The salad was super fresh with mixed greens, red onion, tomatoes, and black olives. The panini looked good too until I looked inside. 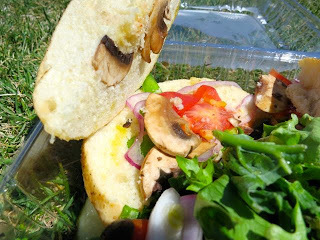 It was described as a panini with fresh mushrooms, bell peppers, tomatoes, and onions topped with a garlic olive oil and red wine vinegar. Instead of plural though, the vegetables should be singular as there was hardly anything inside the bread. It was like an empty sandwich with just a few slices of mushrooms, a couple onions, and a tomato. It was very sad. The bread itself was spectacular and had it been loaded with veggies, this sandwich would have been great. Instead it was a let-down. Next time, I'll have to ask to quadruple the veggies because this was a bit ridiculous. The sandwich also needs a sauce like a pesto sauce - then it would be perfect. They also gave me a sample of their hot sauce, which was oh so good. Twin Falls Sandwich Company - I'm not giving up on you yet. Please add more veggies and a brighter sauce to this panini and make us vegans proud! For $7, you should be able to load on the veggies and we'll all be happy as we sail off into the sunset eating your vegan panini.